This study presents the design of a Computer Education Licensure (CEL) program based on a situated learning theory framework. The study captures instructors' design considerations while designing the courses in the CEL program based on this theoretical framework. The study also captures preservice teachers and alumni perceptions regarding the value of courses that were informed by this framework. Additionally, the study presents longitudinal data from four preservice teachers who pursued their license from the CEL program, and later moved into teaching positions. Longitudinal interview data began capturing perceptions and experiences during participants' internship year in the CEL program and continued into their first and second years of inservice teaching. Based on the analysis of data from these sources, we conclude that situated learning characteristics were present in all courses of the CEL program. The use of three specific situated learning characteristics (authentic contexts, authentic activities, and reflection) were emphasized by all instructors as being major considerations in course design. Despite this, teachers only emphasized the value of having authentic contexts and authentic activities. Suggestions for similar computer science licensure programs are recommended based on these findings. Ozogul, G., Karlin, M. & Ottenbreit-Leftwich, A. (2018). Preservice Teacher Computer Science Preparation: A Case Study of an Undergraduate Computer Education Licensure Program. Journal of Technology and Teacher Education, 26 (3), 375-409. Waynesville, NC USA: Society for Information Technology & Teacher Education. Retrieved April 22, 2019 from https://www.learntechlib.org/primary/p/181432/. Bagley, W.C. (1933). The Ideal Preparation of a Teacher of Secondary Mathematics from the Point of View of an Educationist. The Mathematics Teacher, 26(5), 271-276. Undergraduate Computer Eduation Licensure ProgramBell, R.L., Maeng, J.L., & Binns, I.C. (2013). Learning in context: Technology integration in a teacher preparation program informed by situated learning theory. Journal of Research in Science Teaching, 50(3), 348-379. Bell, S., Frey, T., & Vasserman, E. (2014, March). Spreading the word: introducing pre-service teachers to programming in the K-12 classroom. In Proceedings of the 45th ACM technical symposium on Computer science education (pp. 187-192). ACM. Brush, T., & Saye, J. (2009). Strategies for preparing preservice social studies teachers to effectively integrate technology: Models and practices. Contemporary Issues in Technology and Teacher Education, 9(1), 46-59. Darling-Hammond, L. (2006). Constructing 21st-century tion. Journal of Teacher Education, 57(3), 300-314. DeBoer, G. (1991). A history of ideas in science education: Implications for practice. New York: Teachers College Press. DeLyser, L., Goode, J., Guzdial, M., Kafai, Y., & Yadav, A. (2018). Priming the computer science teacher pump: Integrating computer science education into schools of education. New York: CSforAll. De Vaus, D. (2014). Surveys in Social Research (6th ed). New York, NY: Routledge. Ericson, B., Guzdial, M., & Biggers, M. (2007, March). Improving secondary CS education: progress and problems. In ACM SIGCSE Bulletin (Vol. 39, No. 1, pp. 298-301). ACM. Feiman-Nemser, S., & Buchmann, M. (1987). When is student teaching teacher education?. Teaching and Teacher Education, 3(4), 255-273. Gal-Ezer, J., & Stephenson, C. (2010). Computer science teacher preparation is critical. ACM Inroads, 1(1), 61-66. Gal-Ezer, J., & Stephenson, C. (2014). A tale of two countries: Successes and challenges in k-12 computer science education in Israel and the united states. ACM Transactions on Computing Education (TOCE), 14(2), 8. Goode, J. (2007). If you build teachers, will students come? The role of teachers in broadening computer science learning for urban youth. Journal of Educational Computing Research, 36(1), 65-88.
tion and implementation. Teaching and Teacher Education, 11(1), 33-49. Herrington, J., & Oliver, R. (1995). Critical characteristics of situated learning: implications for the instructional design of multimedia. In Proceedings of ASCILITE 95 conference. 253–262. Hu, H.H., Heiner, C., Gagne, T., & Lyman, C. (2017, March). Building a Statewide Computer Science Teacher Pipeline. In Proceedings of the 2017 ACM SIGCSE Technical Symposium on Computer Science Education (pp. 291296). Hur, J.W., Cullen, T., & Brush, T. (2010). Teaching for application: A model for assisting pre-service teachers with technology integration. 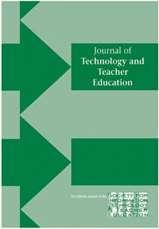 Journal of Technology and Teacher Education, 18(1), 161-182. Johnson, D.W., & Johnson, R. (1985). Classroom conflict: Controversy versus debate in learning groups. American Educational Research Journal, 22(2), 237-256. Klopfer, L.E. (1969), The teaching of science and the history of science. Journal of Research in Science Teaching., 6: 87–95. Kopcha, T.J., & Sullivan, H. (2007). Self-presentation bias in surveys of teachers’ educational technology practices. Educational Technology Research and Development, 55(6), 627-646. Lang, K., Galanos, R., Goode, J., Seehorn,D., Trees, F., Phillips, P., & Stephenson, C. (2013). Bugs in the System: Computer Science Teacher Certification in the US. The Computer Science Teachers Association and The Association for Computing Machinery. Liakopoulou, M. (2012). The Role of Field Experience in the Preparation of Reflective Teachers. Australian Journal of Teacher Education, 37(6). Http://dx.doi.org/10.14221/ajte.2012v37n6.4McLellan,H. (1996).Situatedlearning: Multiple perspectives. Situated learning perspectives, 5-17. Menekse, M. (2015). Computer science teacher professional development in the United States: a review of studies published between 2004 and 2014. Computer Science Education, 25(4), 325-350. Merriam, S.B., & Tisdell, E.J. (2015). Qualitative research: A guide to design and implementation. John Wiley& Sons. Meyers, S., & Lester, D. (2013). The Effects of Situated Learning Through a Community Partnership in a Teacher Preparation Program. Sage Open, 3(3), 1-9. Monk, D.H. (1994). Subject area preparation of secondary mathematics and science teachers and student achievement. Economics of Education Review, 13(2), 125-145. Orland-Barak, L., & Tillema, H. (2006). The ‘dark side of the moon’: A critical look at teacher knowledge construction in collaborative settings. Teachers and Teaching: theory and practice, 12(1), 1-12. Orland-Barak, L., & Yinon, H. (2007). When theory meets practice: What student teachers learn from guided reflection on their own classroom discourse. Teaching and Teacher Education, 23(6), 957-969. Patton, M. (2002). Qualitative research and evaluation methods. Thousand Oaks. Sage. Phillips, P., & Stephenson, C. (2013). Bugs in the System: Computer Science Teacher Certification in the U.S. New York: Computer Science Teachers Association. Ragonis, N., & Hazzan, O. (2009). A tutoring model for promoting the pedagogical-disciplinary skills of prospective teachers. Mentoring& Tutoring: Partnership in Learning, 17(1), 67-82. Schön, D.A. (1987). Educating the reflective practitioner: Toward a new design for teaching and learning in the professions. Jossey-Bass. Seehorn, D., Carey, S., Lee, I., Moix, D., O’Grady-Cuniff, D., Boucher Owens, B., Stephenson, C., & Verno, A. (2011). The CSTA K–12 computer science standards. New York, NY: Computer Science Teachers Association. Seehorn, D., & Clayborn, L. (2017). CSTA K-12 CS Standards for All. In Proceedings of the 2017 ACM SIGCSE Technical Symposium on Computer Science Education. 730-730. Simard, C., Stephenson, C., & Kosaraju, D. (2010). Addressing Core Equity Issues in K–12 Computer Science Education: Identifying Barrier and Sharing Strategies. The Anita Borg Institute and the Computer Science Teachers Association. Palo Alto, CA. Tucker, A., Deek, F., Jones, J., McCowan, D., Stephenson, C., & Verno, A. (2003). A model curriculum for K–12 computer science. Final Report of the ACM K-12 Task Force Curriculum Committee, CSTA. Webb, M., Davis, N., Bell, T., Katz, Y.J., Reynolds, N., Chambers, D.P., & Sysło, M.M. (2017). Computer science in K-12 school curricula of the 2lst century: Why, what and when?. Education and Information Technologies, 22(2), 445-468. Wedman, J.M., & Martin, M.W. (1986). Exploring the development of reflective thinking through journal writing. Reading Improvement, 23(1), 68. Willard-Holt, C., & Bottomley, D. (2000). Reflectivity and effectiveness of preservice teachers in a unique field experience. Action in Teacher Education, 22(2), 76-89. Wilson, C., Sudol, L.A., Stephenson, C., & Stehlik, M. (2010). Running on empty: The failure to teach K-12 computer science in the digital age. New York, NY: The Association for Computing Machinery and the Computer Science Teachers Association. White, M.D., & Marsh, E.E. (2006). Content analysis: A flexible methodology. Library Trends, 55(1), 22-45. Yadav, A., Hong, H., & Stephenson, C. (2016). Computational thinking for all: pedagogical approaches to embedding 21st century problem solving in K-12 classrooms. TechTrends, 60(6), 565-568.